IF YOUR SCHOOL FOOTBALL TEAM does well in an inter-school league, it's something to be pleased about. If your local team are successful, as seen recently in Blackburn, Stockport and Macclesfield, there's jubilation and a sense of pride. If your team win the cup final, that's even better. But when the local team look set to win three national and international competitions, then you've reached the very top. 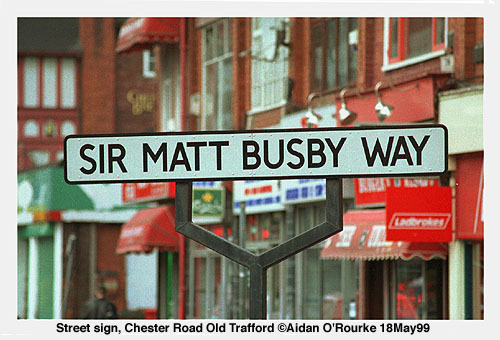 As was remarked, I think, in the "Reputations" documentary about Sir Matt Busby on tv last night, Manchester is the Hollywood of football, and the golden years are right now. 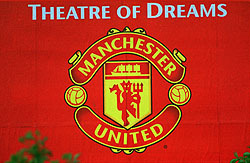 Manchester United are ambassadors for the city. And whether you're in Egypt, India, Australia, Eastern Europe or South America (but not San Francisco!) when you say you're from Manchester, you always get the same response: "Manchester United!". 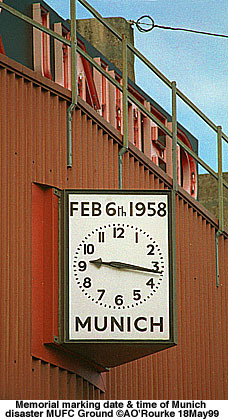 Apologies to Manchester City fans - I'll do a tribute for them when the time is right. And by the way, I don't support any football team. THE MEN HAS A 48 page pull-out "Final Countdown" feature today. There's an advert for a superb painting by Bernard McMullen B.E.M. showing the Old Trafford football ground in the 1980's. More details from Northern Art Promotions. 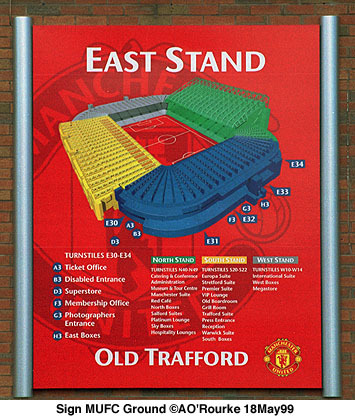 f And don't forget, there's a selection of Manchester United books in the books section of the Manchester Online store. MUFC CAPTAIN ROY KEANE spent last night in a prison cell after an incident in Henry's, behind Kendals. What happened isn't clear, but Maxine Rourke, wife of ex-Smiths guitarist Andy Rourke accused him of abusive behaviour towards her and her friend, who were later asked to leave the bar. He was released without charge this morning and is bailed to appear before a court in July. In the meantime, the police will conduct an investigation. I'm interested to see that the place I often go at lunchtime is a trendy hang-out at night, often frequented by MUFC players, who it's reported, are always courteous and well-behaved. 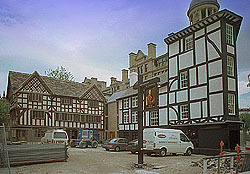 Henry's is behind Kendal's on the ground floor of the recently refurbished Arkwright House, overlooking St Mary's Parsonage. SPOTTING FOOTBALL STARS is a quite a hobby in the "Hollywood of Football". I once saw Eric Cantona in the trendy wine bar "The Nose" in Wilmslow. The ultra-cool punters feigned not to notice him - I didn't recognise him and had to be told who he was. 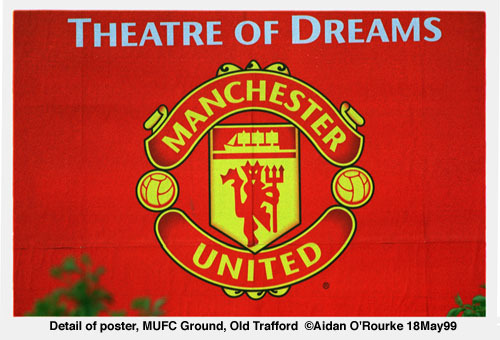 Talking of Cantona, Carl Palmer reports in the Diary that unauthorised copies of a controversial painting have been on sale outside Old Trafford, much to the annoyance of artist Michael Browne, the copyright owner. I saw the original on show at the City Art Gallery last year - It's Renaissance-religious in style, but the "saviour" dressed in Biblical-style robes is Eric Cantona. A GREAT LEAP INTO THE FUTURE is how the developers describe plans for the redevelopment of Piccadilly, which I saw today at the exhibition in the sculpture hall of Manchester Town Hall. A Great Leap into the Unknown is how I'd rather describe them. 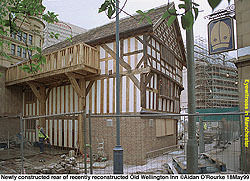 Bernard House to be demolished. 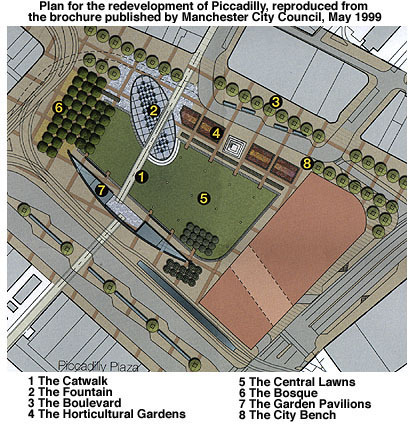 A building to be erected on the Portland St end of the Gardens (the orange rectangle in the map below). 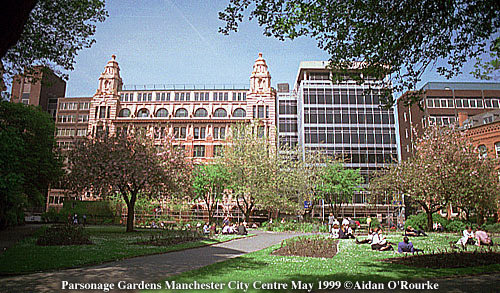 Walk-through fountains lit with coloured lights to be installed near the Oldham street side of the Gardens (number 2). 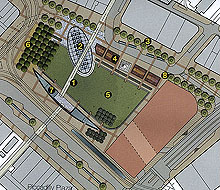 A long, curved walled pavilion (7) will appear next to the the Piccadilly Metrolink stop. 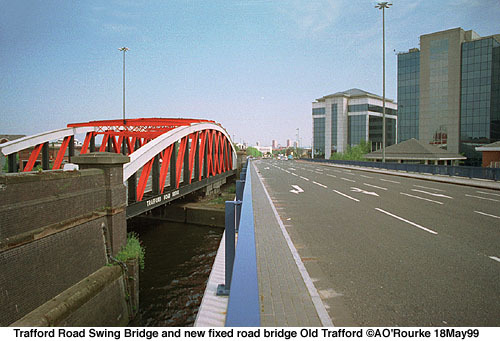 A footbridge, or "catwalk" will span the coloured fountains (2), which will be built in an oval-shaped area adjacent to Oldham Street. My first question is: What is a "Bosque"? There's nothing in my English dictionary. My French dictionary says "bosquet", a small wood or grove. And that's my first criticism - the exhibition doesn't give enough explanation or supporting comments. And what is going to happen to the statues of Peel and Wellington? I assume they will be removed to make way for the "bosque" at the top end, and the unidentified building at the other. 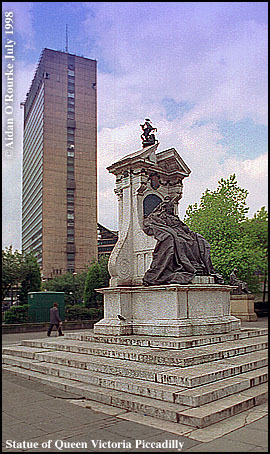 Only the statue of Queen Victoria is being kept. And the big building is the most worrying aspect of the plan - we know nothing of the height and design of this structure, only that money from the sale of the land will help top pay for the redevelopment. The building will cast a shadow over the gardens.As if to compensate for the loss of a quarter of the Gardens, the remodelled area "spills out" beyond the present boundary of the gardens and onto the historic Market St-Piccadilly-London Rd street line. 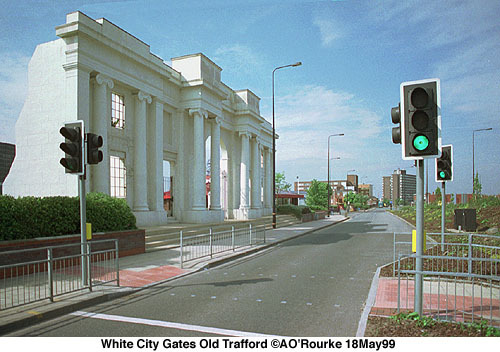 Eyewitness in Manchester says: Maintain the existing layout of Piccadilly - a wide square with four sides, like Grosvenor Square in London. This magnificent open expanse was created by the demolition of the Infirmary in 1906 and the destruction of in the 1940 Blitz of a run-down block at the top. Why build on it again? And as for the walk-through fountain, no elaborate hydrotechnics are required to create successful green areas in cities, as a visit to Paris or New York illustrates. How will the fountains look on rainy days? And in the winter? And after five years? 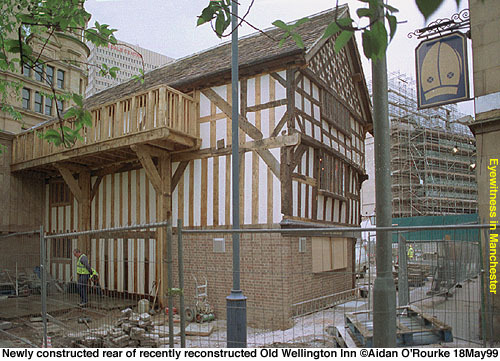 Simple renovation and reconstruction of the Gardens would be far more appropriate and less costly. THE MANCHESTER CIVIC SOCIETY held their final talk in the current series, which is sponsored by British Telecom. 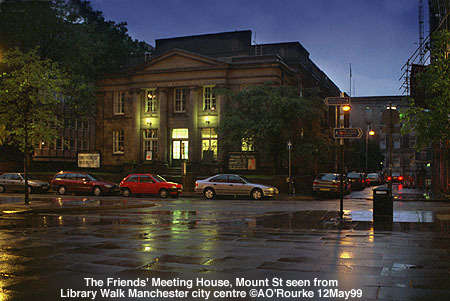 The talks have been held at the Friends Meeting House (above left), behind the library (above right) . 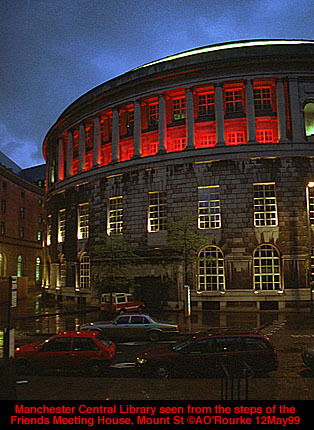 The speaker was Eamonn Canniffe, co-Author of the recently-published "An Architectural Guide to Manchester". He was also critical of the plans for Piccadilly. TWO PLANELOADS OF KOSOVAN REFUGEES have arrived at Manchester Airport this week. They're being housed in Oldham and Trafford. "Our neighbours the Serbs made life hell... why are you so kind?" said the headline of Kevin Feddy's article in Wednesday's MEN. More refugees will be arriving, and are to be accommodated in Bury and Stockport. Demonstrations against the bombing have continued. And independent MP and former war journalist Martin Bell, who has writes a monthly page in the Evening News, says "Nato bombing is doing us real damage". IT'S REGIONAL PRESS WEEK and the aim is to raise awareness of the regional newspapers, and to encourage advertisers to give them more priority. I can empathise with this - Manchester is often considered a "limited interest" subject for a website, despite the fact that the Greater Manchester area has a larger population than many countries. CRICKET FANS may be interested in a new website operated by Lancashire County Cricket Club www.lccc.co.uk. 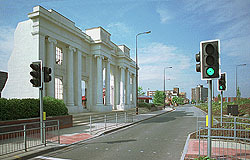 Designed by Portsmouth webmaster Anton Russell, it was featured in Friday's Infotec in the MEN. 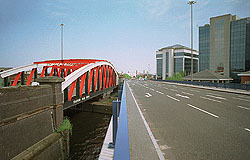 The Lancashire County Cricket Ground is in Old Trafford (pictures above), which has been transformed by new roads, roundabouts and retail parks. MANCHESTER-BASED web design house Music Online have won the Best Artist Website award at the UK Music New Media awards their B*Witched site, the official website of the Irish girl band. Nice work - bright colours and good design, though I think you have to be a B*Witched fan to fully appreciate it. Also have a look at Music Online's dark and stylish website, though with rather ae rather illegible square font at www.musicon-line.com. MANCHESTER ONLINE will soon be available via a digital cable TV service, it was reported in Wednesday's Media Business page in the MEN. The MEN's New Media offshoot, has come to an agreement with Cable and Wireless Digital, and will provide the Manchester Online website, which will appear alongside digital interactive TV services. Sounds great! THE PARENTS OF LOUISE WOODWARD were arrested last week in connection with an investigation into fraud. A £9000 accommodation bill is at the centre of the allegations, and the Crown Prosecution Service is currently deciding whether to bring charges. Sue and Gary Woodward are now separated. Louise Woodward, who, it's stressed, is not involved in the investigation, is studying Law at South Bank University. GREATER MANCHESTER POLICE have launched a campaign to urge people not to use the 999 number except in genuine emergencies, or to use their words: "When there is an immediate threat to life or property". For general enquiries, the public should use the number 0161 872 5050 or call crimestoppers on 0800 555111. 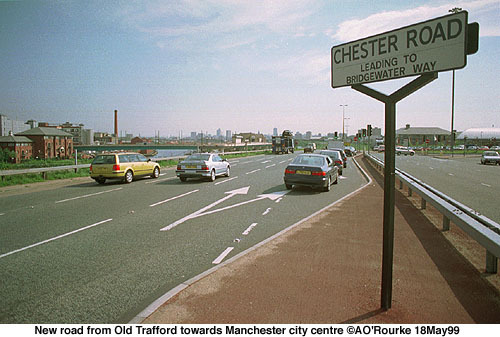 This ad is just near the GMP's unlovely Headquarters on Boyle Street Old Trafford. And they police have also been checking tyres this week. I've just had a new one fitted, and so for once, I hope I'm stopped! A FILM BY A SALFORD FILM MAKER has been greeted with standing ovations at the Cannes Film Festival. "East is East" was written by Ayub Khan-Din and is based on his play of the same name, premiered at Pendleton College three years ago. 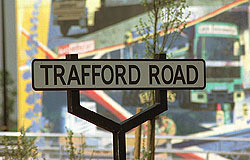 He grew up near Trafford Road, pictured below. 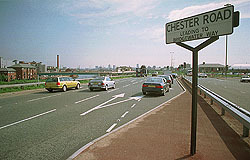 The filming was done in Weaste last September. My film director friend Stephen Gibbons is hoping to commence filming of his epic "Chicanery Moon" later this year. He's also taken over the running of the official website of American actor Henry Thomas, who starred in "ET". 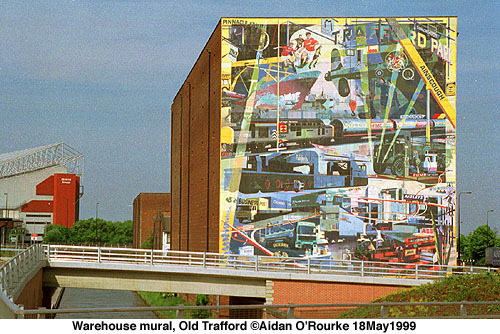 ROB GRETTON, one of the men behind the Hacienda club and legendary Manchester band New Order, has died aged only 47. He had suffered from a heart complaint. 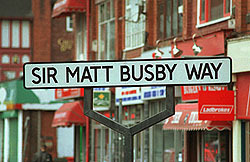 He died in his sleep at his home in Chorlton. Rob Gretton is mentioned by Tony Wilson in the EWM interview of last year. PERFORMANCES THIS WEEK have included The Chieftains at the Bridgewater Hall, "Hobson's Choice" at Farnworth Little Theatre, Reef, and Mike and the Mechanics at the Apollo, "The Sound of Music" at Middleton Civic Centre, "Take Away" at the Library Theatre, "Best Disco in Town" at the MEN Arena, featuring Odyssey, The Real Thing, Rolls Royce, The Three Degrees and Sister Sledge, KC and the Sunshine Band. The Importance of Being Earnest at the Bolton Octagon, Gothenburg SO and the Halle at the Bridgewater Hall. And another interesting performance at the MEN Arena was the World Wrestling Federation European Championship. Waiting for Godot is on at the Royal Exchange Theatre, and Salman Rushdie is at the Pearl City Restaurant tomorrow night, reading from his new novel. 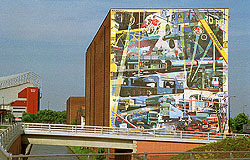 STREETS AHEAD has continued its run, moving out to Middleton, Eccles and Ashton-under-Lyne. The climax of the festival is on the bank holiday Monday, when the Great Northern Square will be officially opened. That's going to be a spectacular event, and I intend to be there. 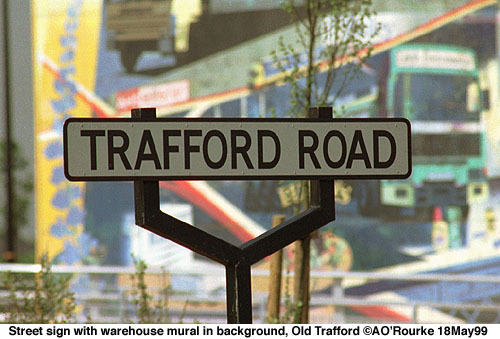 CORONATION STREET did well at the 1999 British Soap Awards, to be shown on TV tomorrow night. John Savident, who plays Fred Elliot, won Best Comedy Performance, David Neilson and Julie Hesmondhalgh, alias odd couple Roy and transsexual Hayley, won Best On-Screen Partnership. And Stephen Billington, alias Greg Kelly was named Villain of the Year. WHAT'S THE QUICKEST mode of communication between Manchester and Australia - downloading this website or sending me an e-mail pretty quick, but how about the slowest way - it's got to be by bike, and a rider from Levenshulme has cycled all the way from Sydney to Levenshulme. Nick Linton rode his hand-built orbit bicycle overland, presumably taking ferries in between, through Australasia, Asia and Europe. I'm thinking of buying a bike, but the furthest I'll be going is probably Knutsford. 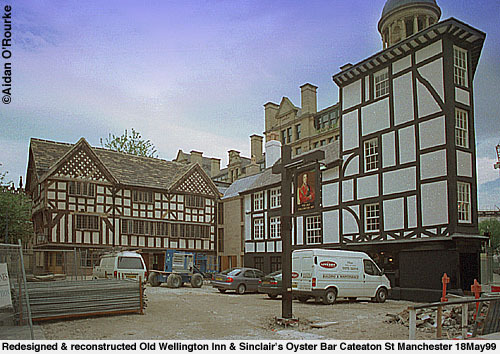 AND FINALLY here are a couple of photos of the newly reconstructed Old Wellington Inn and Sinclair's Oyster House, known as the Shambles (which originally referred to their former location). I'll spare my comments for this week, having already given my views on the plans for Piccadilly. IT'S BEEN COOL THIS WEEK, with lots of cloud and some rain. Showers forecast for this afternoon never arrived, though it was a bit cloudy when I took the pictures of the reconstructed buildings above. I'll return on a sunny day when the work is finished and get some better shots.